Ebadollahi Natanzi, A., Mahmoudian, S., Minaeie, B., Sabzevari, O. (2011). Hepatoprotective activity of phloretin and hydroxychalcones against Acetaminophen Induced hepatotoxicity in mice. Iranian Journal of Pharmaceutical Sciences, 7(2), 89-97. Ali Reza Ebadollahi Natanzi; Shima Mahmoudian; Bagher Minaeie; Omid Sabzevari. "Hepatoprotective activity of phloretin and hydroxychalcones against Acetaminophen Induced hepatotoxicity in mice". 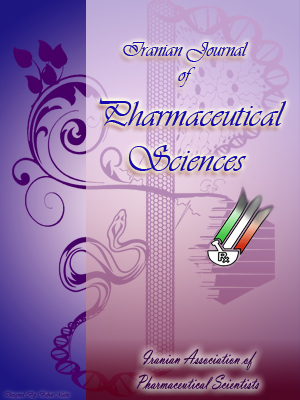 Iranian Journal of Pharmaceutical Sciences, 7, 2, 2011, 89-97. Ebadollahi Natanzi, A., Mahmoudian, S., Minaeie, B., Sabzevari, O. (2011). 'Hepatoprotective activity of phloretin and hydroxychalcones against Acetaminophen Induced hepatotoxicity in mice', Iranian Journal of Pharmaceutical Sciences, 7(2), pp. 89-97. Ebadollahi Natanzi, A., Mahmoudian, S., Minaeie, B., Sabzevari, O. Hepatoprotective activity of phloretin and hydroxychalcones against Acetaminophen Induced hepatotoxicity in mice. Iranian Journal of Pharmaceutical Sciences, 2011; 7(2): 89-97. 1Department of Toxicology and Pharmacology, Faculty of Pharmacy, Tehran University of Medical Sciences, Tehran, Iran. Department of Medicinal Plants- Natural Resources, Agriculture Center for Higher Education, Agricultural Research, Education & Extension Organization, Karaj, Iran. Polyphenolics form a major part of the dietary antioxidant capacity of fruits and vegetables have been identified as chemopreventive or anticancer agents. Hydroxychalcones are polyphenols abundantly distributed throughout the plant kingdom and are compounds with two aromatic rings (benzene or phenol) and an unsaturated side chain. In the present study, effect of phloretin (apple major flavonoid), 4-hydroxychalcone and 4' -hydroxy-chalcone were investigated against acetaminophen-induced acute liver damage. The study was designed as multiple dose pre- and post-treatments. Mice were administrated acetaminophen (1g/kg and 640 mg/kg for mortality and acute toxicity experiments, respectively). Mortality rate, serum transaminases (SGOT and SGPT) and histological examination were applied. Acetaminophen produced 100% mortality at the dose of 1 g/kg in mice, while pre-treatment and post-treatment (i.p., twice daily for 48 hrs) of animals with phloretin and 4-hydroxychalcone (50 mg/kg) and 4'-hydroxychalcone (25 mg/kg) significantly reduced the mortality rate. Acetaminophen produced acute toxicity at the dose of 640 mg/kg in mice, while pre- and post-treatments of animals with phloretin and hydroxychalcones significantly lowered the rise in SGOT and SGPT. Liver sections collected for histological examination showed cellular changes including centrilobular necrosis, extensive portal inflammation, and micro and macro vesicular structures in the acetaminophen group. These cellular changes were reduced following treatment of mice with Phloretin and hydroxychalcones. Taken collectively, from the results of this study it may be suggested that phloretin and hydroxychalcones have hepatoprotective activity against acetaminophen liver injury in mice. Daily diet of human contains approximately 1 g of herbal phenols which can also be found in many traditional medicines. Most of antioxidant capability of fruits and vegetables is due to the poly phenols. These compounds include caffeic acid (present in tea and coffee), capsaicin (found in red pepper), resveratrol (found in red grape), gallic acid (found in rhubarb), flavonoids and chalcones [1-3]. Chalcones are secondary metabolite of plants which their chemical structure is similar to curcumine, a known antioxidant. They include 2 benzene rings which relate to each other by an unsaturated -carboxyl group. By now, many therapeutic features have been proposed for chalcones including antifungal, anti-bacterial, anti-malaria, anti-lishemania, anti-mutation and chemopreventive activities. Some of these characteristics have been related to antioxidant capacity and capturing the metallic ions [4-6]. Phloretin (major chalcone of apple, a dihy-drochalcone) and isoliquiritigenin (2', 4', 4-trihydroxy-chalcone, a licorice chalcone), are important compounds of this group which have been studied extensively . Until a few years ago, the occurrence of phloretin was considered restricted to apples. The identification and isolation of phloridzin in strawberries, however, extended the knowledge of the natural sources of this polyphenolic compound . It can be expected that phloretin will be found in additional plant species in the future. Despite biological and therapeutical characteristics of chalcones, importance of these compounds has not yet fully understood. Liver is the largest organ in the vertebrate body and its strategic location between intestinal tract and the rest of the body facilitates its task of maintaining metabolic homeostasis of the body. Therefore, the liver, as opposed to other organs, is the dominant target site of specific toxins. Many medicines such as isoniasid, tetracycline, antidepres-sants, acetaminophen, halothane, and a number of industrial compounds as well as natural poisons (e.g., Aflatoxin B1) and bacterial infections can cause liver diseases [9-11]. Acetaminophen, an analgesic antipyretic medicine which is usually sold without prescription (OTC), is mostly metabolized by liver through glucuronidation and sulfation pathways . It is also metabolized to a reactive intermediate namely N- acetyl parabenzoquinoneimine, which can cause liver damage if is not detoxified [13, 14]. The toxic metabolite production will increase following exposure to high levels of the parent compound while alternative detoxification mechanisms are compromised . The compounds presently used in acetaminophen heptotoxicity have inadequate effects and sometimes accompanied with serious adverse effect. N-acetylsystein (NAC) is widely used as an antidote to acetaminophen overdose but can cause adverse effects . In the search to find an alternative remedy which can be used more efficiently and safely in liver damages we studied hepatoprotective effect of three members of hydroxy chalcones, namely phloretin, 4-hydroxy chalcone (4-HC) and 4'- hydroxy chalcone (4'-HC) against acetaminophen-induced liver toxicity in mice. Chemicals: 4-Hydroxy chalcone (4-HC) and 4'- hydroxy chalcone (4'-HC) were purchased from Indofine Chemical Company Inc. (NJ, USA). 2', 4', 6', 4-Tetrahrdroxydihy-drochalcone (phloretin) and methyl cellulose were obtained from Sigma-Aldrich Company (St. Louis, MO, USA). The solvents including ethanol, tween 80 and acetaminophen were supplied by Merck Company (Darmstadt, Germany). All chemicals were of the highest available commercial grade. Animals: All animal experiments were conducted according to the policy of MOH Convention for the Protection of Vertebrate Animals Used for Experimental and other Scientific Purposes, and the protocol was approved by the Ethics Committee of the Tehran University of Medicine Sciences (TUMS), Tehran, Iran. Male albino mice weighing 25-30 g prepared from Pasteur’s Institute (Tehran, Iran). The animals were kept under 12/12 light/ dark in Animal Care Center, Faculty of Pharmacy, TUMS. The mice were allowed free access to standard laboratory feed and water before experiment. Liver injury was produced in the 12 h fasted rats. Multiple doses pre-treatment: Mice were divided into 11 groups of 6 animals each. Group 1 (control blank) received vehicle (Normal saline, NS). Group 2 received 4 doses of NS at 12h intervals plus acetaminophen (1 g) orally 1h after the last dose of NS. Groups 3, 6 and 9 treated with 4 doses of phloretin or 4'-HC or 4-HC (25 mg/kg) at 12h intervals and received acetaminophen (1 g) orally 1h after the last dose. Groups 4, 7 and 10 treated with 4 doses of phloretin or 4'-HC or 4-HC (50 mg/kg) at 12h intervals and received acetaminophen (1 g) orally 1h after the last dose. Groups 5, 8 and 11 treated with 4 doses of phloretin or 4'-HC or 4-HC (100 mg/kg) at 12h intervals and received acetaminophen (1 g) orally 1h after the last dose. Multiple doses post-treatment: Mice were divided into 11 groups of 6 animals each. Group 21 (control blank) received vehicle (Normal saline, NS). Group 22 received acetaminophen (1 g) orally at 0h then 4 doses of NS (every 6h until 24 h). Groups 23, 26 and 29 received acetaminophen (1 g) orally at 0h then treated with 4 doses (every 6h) of phloretin or 4'-HC or 4-HC (25 mg/kg). Groups 24, 27 and 30 received acetaminophen (1 g) orally at 0h then treated with 4 doses (every 6h) of phloretin or 4'-HC or 4-HC (50 mg/kg). Groups 25, 28 and 31 received acetaminophen (1 g) orally at 0h then treated with 4 doses (every 6h) of phloretin or 4'-HC or 4-HC (100 mg/kg). Group 41 (control blank) received vehicle (Normal saline, NS). Group 42 received 4 doses of NS at 12h intervals plus acetaminophen (640 mg) orally 1h after the last dose. Groups 43, 46 and 49 treated with 4 doses of phloretin or 4'-HC or 4-HC (25 mg/kg) at 12h intervals and received acetaminophen (640 g) orally 1h after the last dose. Groups 44, 47 and 50 treated with 4 doses of phloretin or 4'-HC or 4-HC (50 mg/kg) at 12h intervals and received acetaminophen (640 g) orally 1h after the last dose. Groups 45, 48 and 51 treated with 4 doses of phloretin or 4'-HC or 4-HC (100 mg/kg) at 12h intervals and received acetaminophen (640 g) orally 1h after the last dose. Group 61 (control blank) received vehicle (Normal saline, NS). Group 62 received acetaminophen (640 g) orally at 0h then 4 doses of NS (every 6h until 24 h). Groups 63, 66 and 69 received acetaminophen (640 g) orally at 0h then treated with 4 doses (every 6h) of phloretin or 4'-HC or 4-HC (25 mg/kg). Groups 64, 67 and 70 received acetaminophen (640 g) orally at 0h then treated with 4 doses (every 6h) of phloretin or 4'-HC or 4-HC (50 mg/kg). Groups 65, 68 and 71 received acetaminophen (640 g) orally at 0h then treated with 4 doses (every 6h) of phloretin or 4'-HC or 4-HC (100 mg/kg). Figure 1. Mortality rate study, pre-treatment. Effect of pre-treatment with phloretin, 4'-HC and 4-HC (Hydroxychalcone) on mortality rate resulting from acute acetaminophen toxicity (1 g/kg); *P < 0.01. Mice were anaesthetized with chloroform 24h after the treatment and blood was collected by cardiac puncture using sterile disposable syringes. Serum was separated by centrifugation (5000 g for 5') and serum glutamate oxaloacetate transaminase (GOT) and glutamate pyruvate transaminase (GPT) were estimated on the same day spectropho-tometrically using commercial diagnostic kits prepared from Man Laboratory manufacturer in Tehran, Iran. For histopathological study, the livers were immediately removed after autopsy and the tissues were fixed in 10% formalin for a period of at least 24 h. The paraffin sections were then prepared (Automatic Tissue Processor, Lipshaw) and cut into 5-µm-thick sections in a rotary microtome. The sections were then stained with haema-toxylin–eosin dye (Merck) and mounted with Canada balsam. The histopathological slides were examined and photographs were taken with a Carl Zeiss Jena amplual type photomicro-scope (3.2²10 and 10²10). Figure 2. Mortality rate study, post-treatment. Effect of post-treatment with phloretin, 4'-HC and 4-HC (Hydroxychalcone) on mortality rate resulting from acute acetaminophen toxicity (1 g/kg); *P < 0.01. The data obtained were analyzed by one-way analysis of variance (ANOVA) and Student’s t-test for the possible significant interrelation between the various groups. The data were analyzed with the help of Instat computer software. Probability levels of less than 0.05 were considered significant. Figure 3. Effect of pre-treatment with phloretin, 4'-HC and 4-HC (Hydroxychalcone) on SGOT and SGPT Values. The preventive effects of phloretin and hydroxychalcones against lethal dose of acetaminophen (1 g/kg) following pre- and post-treatment studies (doses of 25, 50 and 100 mg/kg) were shown in Figure 1. Acetaminophen at the dose of 1 g/kg induced more than 65% lethality in mice (Figures 1&2). Phloretin and hydroxychalcones at the dose of 50 mg/kg remarkably reduced mortality rate of mice resulting in protection against lethal effect of acetaminophen (p < 0.01). In this sense, 4'-hydroxychalcone was able to reduce the mortality rate even at the lowest dose of 25 mg/kg. In the pre-treatment study, 4'HC significantly (p < 0.01) reduced the elevation of SGOT and SGPT at the low dose (50 mg/kg). Phloretin at the all employed doses decreased SGOT values but the SGPT activity was influenced significantly only at 50 mg/kg. 4HC effectively reduced both SGOT and SGPT values at 50 mg/kg and SGOT at 100 mg/kg (Figure 3). The same pattern of protection was demonstrated following post-treatment study but SGPT was not reduced by any of the compounds at the low (50 mg/kg) and high (100 mg/kg) doses. Nevertheless, phloretin and 4HC reduced SGOT at 50 mg/kg which was the best protection observed at the post-treatment study (Figure 4). Figure 4. Effect of post-treatment with phloretin, 4'-HC and 4-HC (Hydroxychalcone) on SGOT and SGPT Values. Histological analysis of liver sections showed marked pathological changes in liver parenchyma as a result of acetaminophen toxicity as compared to the control. There were severe cell infiltration around the periportal system, vacuolization of the parenchymal cells and focal necrosis. The changes were found to be much less in phloretin and 4HC groups. In the 4'HC group, mild to moderate attenuation in pathological changes were observed (Figure 5). Figure 5. Histological studies. Histological images of mice livers displaying normal lobular architecture with central veins and radiating hepatic cords in saline control mice (A). Slide (B) depicted the significant cell infiltration around the periportal system, vacuolization of parenchymal cells, focal necrosis and central vein dilation in acetaminophen control mice. Pret-treatment with Phloretin (C), 4'-HC (D) and 4-HC (E) (50 mg/kg) significantly reduced degree of liver damage and degeneration (H&E, 40X). The study provides evidence that phloretin and the employed hydroxychalcones (50 mg/kg) remarkably reduced mortality rate of mice resulting from protection against lethal effect of acetaminophen (Figures 1&2, p < 0.01). In this sense, 4'-hydroxychalcone was able to reduce the mortality rate even at the lower dose of 25 mg/kg. Phloretin and its glucoside phloridzin are abundantly presentin apples, particularily in the peel, and in strawberries (8,17,18). Recent experimental research has suggested that phloridzin could be potentially used to treat various disease states such as diabetes, obesity, and hyperglycemia. Inhibition of glucose cotransporter1, however, has been proposed as the main biological action of phloretindescribed in the literature (19,20). Nevertheless, phloretin possesses antioxidative properties and other studies have established the pharmacophore responsiblefor the antioxidative activity of phloretin (21,22). Recently a study demonstrated that some of the biological actionsof phloretin may contribute to the observed protective cardiovascular effectsof diets rich in flavonoids (23). The present study in agreement with other studies showed that overdosage of acetaminophen can cause liver damage which is pronounced clinically as jaundice, steatosis and fibrosis (24). Acetaminophen induced hepatotoxicity is a commonly model used to examine liver damage and to screen the hepatoprotective activity of compounds (25). Its reactive metabolite N-acetyl-p-benzoquineimine (NAPQI) causes free radical production as peroxinitrite (26). Structural damage and the function integrity of hepatocytes can be studied using a series of cellular enzymes including AST, ALT and LDH (27,28,29,30). The increased serum level of these enzymes is a valuable indicator of liver membrane damage and necrosis; since they are cytoplasmic enzymes in location and their release into the systemic circulation is attributed to the cellular damage (28). Our findings demonstrated that; high dose administration of acetaminophen (640 mg/kg) in animals causes severe hepatocellular injury as indicated by the significant elevation of aminotransferse enzyme activities which account as indicator of the cellular damage and liver functions (P<0.01, Figures 3&4). In the pre-treatment study, phloretin, 4'HC and 4HC markedly (p < 0.01) reduced the elevation of ALT and AST at 50 mg/kg (Figure 3). This indicates that 2 days administration of the chalcones can protect the animals against acetaminophen induced liver damage. The same pattern of protection was demonstrated following post-treatment study but SGPT was not reduced by any of the compounds at the low (50 mg/kg) and high (100 mg/kg) doses. Nevertheless, phloretin and 4HC reduced SGOT at 50 mg/kg which was the best protection observed at the post-treatment study (Figure 4). Histopathological data of the acetaminophen intoxicated animals showed liver toxicity including severe centrilobular necrosis, fatty infiltration and lymphocytes infiltration. The findings were significantly decreased in the hydroxychalcones treated groups (Figures 4 and 5). The findings further support the biochemical data. Taken collectively, from the results of this study it may be suggested that phloretin and the two employed hydroxychalcones have hepatoprotective activity against acetaminophen liver injury in mice. Thus, the present study provides a scientific rationale for the application and commercial uses of natural products in management of liver diseases. This research was achieved by a grant from the vice chancellor for research, Tehran University of Medical Sciences (TUMS), Tehran, Iran. Bohm BA. Chalcones and aurones, In: Dey PM, Harborne JB, (editors). Plant phenols, Academic Press, London, 1989; pp. 237–82. Dhar DN. The chemistry of chalcones and related compounds. New York: Wiley, 1981. Tomas–Barberan FA, Clifford MN. Flavones, chalcones and dihydrochalcones–nature occurrence and dietary burden. J Sci Food Agric 2000; 80: 1073–80. Hsieh HK, Tsao LT, Wang JP, Lin CN. Synthesis and anti-inflammatory effect of chalcones. J Pharm Pharmacol 2000; 52: 163–71. Satyanarayana K, Rao MNA. Antiinflammatory, analgesic and antipyretic activities of 3-(4-(3-(4-dimeThylaminophenyl)–1-oxo-2–propenyl) phenyl sydnone. Indian Drugs 1993; 30: 313-18. Ballesteros JF, Sanz MJ, Ubeda A, Miranda MA, Iborra S, Paya M, Alcaraz MJ. Synthesis and pharmacological evaluation of 2'-hydroxy chalcones and flavones as inhibitors of inflammatory medicators generation. J Med Chem 1995; 38: 2794–7. Hsieh HK, Tsao LT, Wang JP, Lin CN. Synthesis and anti-inflammatory effect of chalcones. J Pharm Pharmacol 2000; 52 163-71. Hilt P, Schieber A, Yildirim C, Arnold G, Klaiber I, Conrad J, Beifuss U, Carle R. Detection of phloridzin in strawberries (Fragaria x ananassa Duch.) by HPLC-PDA-MS/MS and NMR spectroscopy. J Agric Food Chem 2003; 51: 2896-2899. Vale JA. Paracetamol poisoning. Lancet 1995; 346: 547–52. Crppin JC. Acetaminophen Hepatotoxicity potentiation by isoniazid. Am J Gastroenterol 1993; 88: 590–2. Minton N, Heny J, Frankel R. Fatal paracetamol poisoning epidemic. Hum Toxicol 1988; 7: 33 – 4. Moling O, Cairon E, Rimenti G, Rizzi F, Pristira R, Mian P. Sever hepatotoxicity after therapeutic doses of acetaminophen. Clin Therapy 2006; 28: 755-60. Dahlin DC, Miwa GT, Lu AYH, Nelson SD. N-acetyl-p-benzoquinone imine: A cytochrome P-450-mediated oxidation product of acetaminophen. Proc Nati Acad Sci 1984; 81: 1327-31. Zhang Q, Melnikov Z, Feierman DE. Character-ization of the acetaminophen-induced degradation of cytochrome p450-3A4 and the proteolytic pathway. Basic & Clin Pharmacol & Toxicol 2004; 94: 191-200. Chen YH, Lin FY, Liu PL, Huang YT, Chiu JH, Chang YC, Man KM, Hong CY, Ho YY, Lai MT. Antioxidative and hepatoprotective effects of Magnolol on acetaminophen- induced liver damage in rats. Arch Pharm Res 2009; 32: 221-28. Kanter MZ. Comparison of oral and i.v. acetylcysteine in the treatment of acetaminophen poisoning. Am J Health-Syst Pharm 2006; 63: 1821-27. Escarpa A, González MC. High-performance liquid chromatography with diode-array detection for the determination of phenolic compounds in peel and pulp from different apple varieties. J Chromatogr 1998; A823: 331-7. Tsao R, Yang R, Young JC, Zhu H. Polyphenolic profiles in eight apple cultivars using high-performance liquid chromatography (HPLC). J Agric Food Chem 2003; 51: 6347-53. Xiao C, Cant JP. Glucose transporter in bovine mammary epithelial cells is an asymmetric carrier that exhibits cooperativity and trans-stimulation. Am J Physiol Cell Physiol 2003; 285: C1226-C1234. Raja MM, Tyagi NK, Kinne, RKH. Phlorizin recognition in a C-terminal fragment of SGLT1 studied by tryptophan scanning and affinity labeling. J Biol Chem 2003; 278: 49154-4963. Rezk BM, Haenen GRMM, Vander Vijgh WJF, Bast A. The antioxidant activity of phloretin: the disclosure of a new antioxidant pharmacophore in flavonoids. Biochem Biophys Res Commun 2002; 295: 9-13. Nakamura Y, Watanabe S, Miyake N, Kohno H, Osawa T. Dihydrochalcones: evaluation as novel radical scavenging antioxidants. J Agric Food Chem 2003; 51: 3309-12. Stangl V, Lorenz M, Ludwig A, Grimbo N, Guether C, Sanad W, Ziemer S, Martus P, Baumann G, Stangl K. The flavonoid phloretin suppresses stimulated expression of endothelial adhesion molecules and reduces activation of human platelets. J Nutr 2005; 135: 172-8. Lewis JH, Ahmed M, Shobassy A, Palese C. Drug induced liver disease. Curr Opin Gastroenterol 2006; 22: 223-33. Porchezhian E, Ansari SH. Hepatoprotective activity of Abutilon indicum on experimental liver damage in rats. Phytomedicine. 2005; 12: 62–4. Nelson SD. Molecular mechanisms of the hepatotoxicity caused by Acetaminophen. Semin Liver Dis 1990; 10: 267–78. William RT. Detoxification Mechanisms. New York, USA: John Willey, 1971. Kew MC. Serum aminotransferase concentration as evidence of hepato cellular damage. Lancet 2000; 355: 591-592. Beumer JH, Schellens JHM, Beijnen JH. Hepatotoxicity and metabolism of trabectedin: a literature review. Pharmacol Res 2005; 51: 391-8.